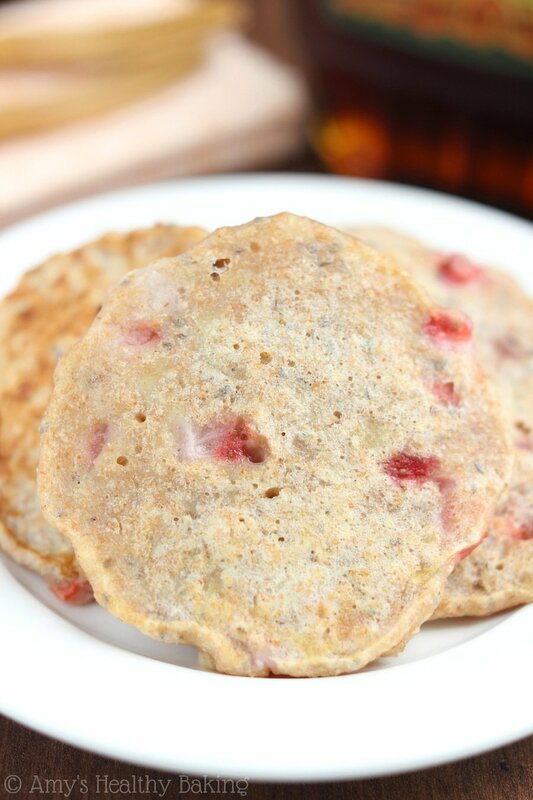 An easy recipe for healthy pancakes packed with fiber & two servings of fruit. 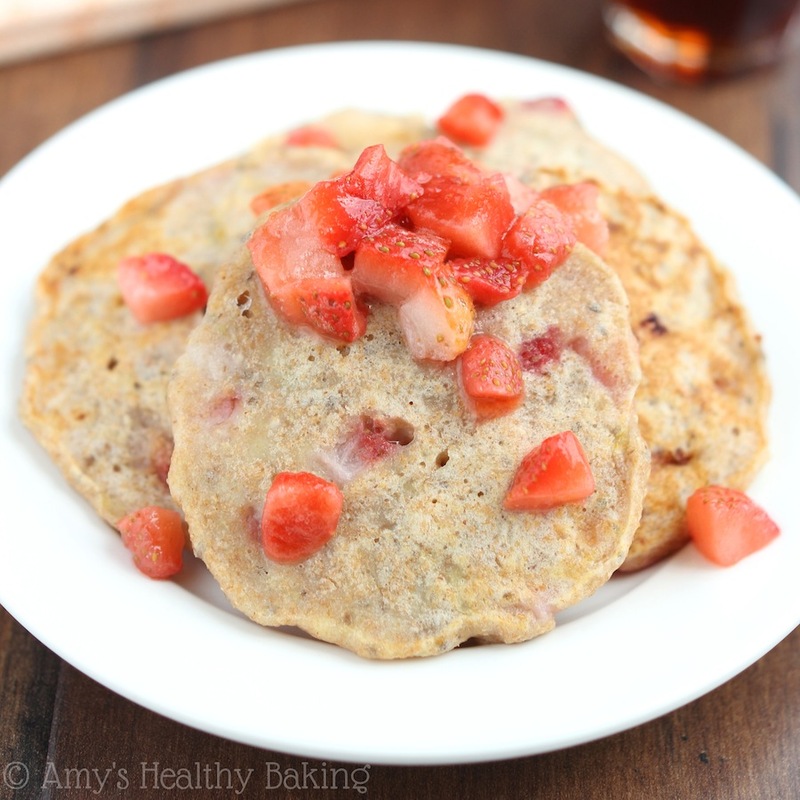 You’ll fall in love with this sweet & skinny breakfast! Almost two years ago, I reconnected with an old high school friend when I discovered she worked in a bakery. 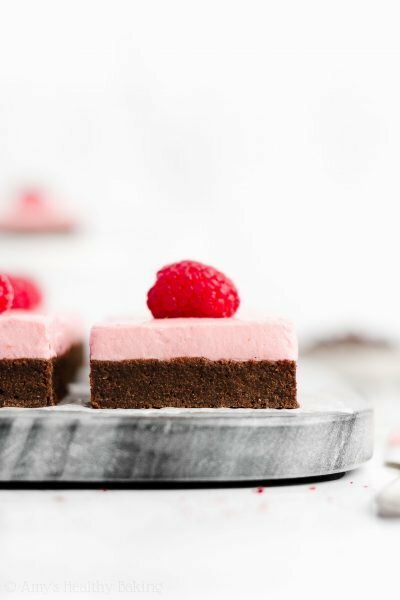 (Almost every baking blogger dreams of opening their own someday, including me!) 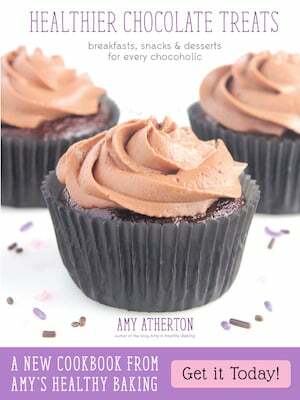 She spent her days kneading bread, frosting cupcakes, and decorating cakes—all for customers—so none of it sat on her kitchen counter tempting her for another bite every time she walked by. Too far apart to meet on a weekly basis, we started having “virtual” coffee dates about a year ago. We’d both grab a glass (usually of water, ironically enough), pull out our techie devices, and FaceTime for an hour, trading stories about life’s little updates. We scheduled one for last Friday afternoon, but half an hour before, I received a frantic text. Water started leaking from her ceiling and she couldn’t figure out why—what a nightmare! So we agreed on a rain check until she and her husband could solve their watery woes. After a few moments of thought, I bounced over to my guy where he sat at the kitchen table, preparing for his night. He volunteers at a comic book and game store every Friday, helping run their evening events and tournaments. Although I normally stay home, I asked to drive to the city with him. A quiet and cozy Panera sits right around the corner from the shop, and I’d been dying for their summery Strawberry Poppy Seed & Chicken Salad! So instead, I spent my evening blissfully happy at my favorite table, a tiny two-seater right next to the back door with the power outlet located right behind my chair. As I nibbled on their whole grain baguette, I typed up a blog post, browsed Pinterest, and caught up on my favorite blogs. A little quick thinking turned that unexpected Plan B into the highlight of my weekend! 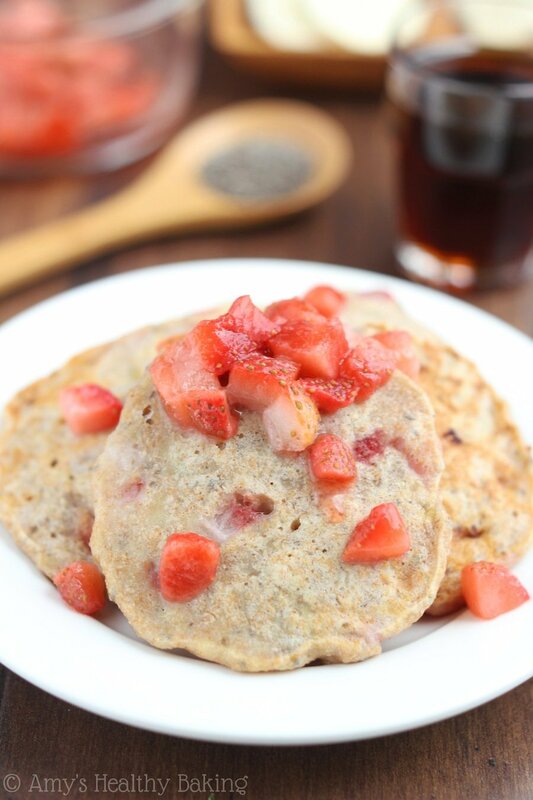 Just like my Friday night, these Strawberry Banana Chia Seed Pancakes were an unexpected yet happy accident too! After buying one too many bananas at TJ’s last week, a speckly straggler sat on my countertop, and with 100° temperatures outside—too hot to bake my favorite bread!—I decided to flip on the stove and cook breakfast instead. Soft and moist, these fruity silver dollars completely hit the spot. 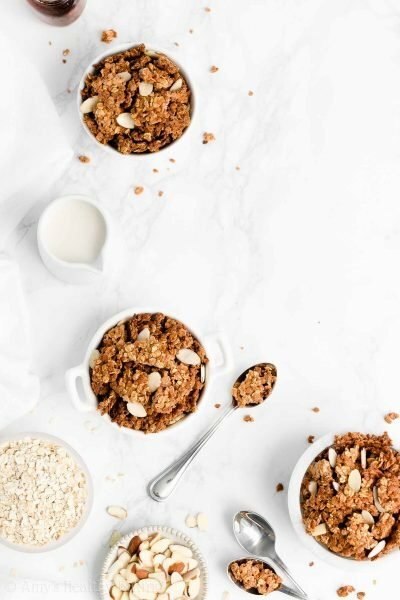 Their summery yet comforting flavor, sweet smell, and cute pale pink freckles enchanted my tastes buds and tummy—the mark of a perfect breakfast! 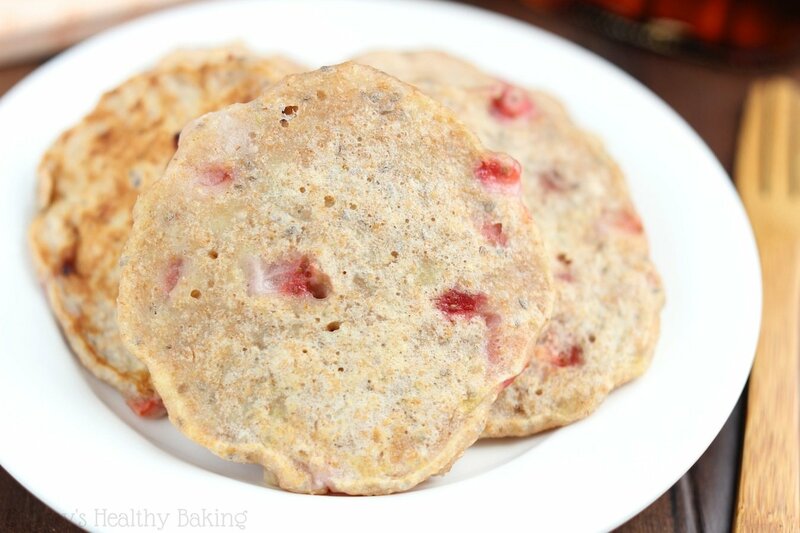 Even better, they’re clean eating, low fat, and packed with fiber to keep you full all morning long. In this easy recipe, the mashed banana replaces the egg, so by another happy accident, they’re vegan too! The riper your banana, the sweeter your pancakes will be, so grab the darkest, spottiest one you can find. I didn’t add any extra sugar to the batter; between the banana and strawberries, the pancakes already satisfied my sweet tooth. 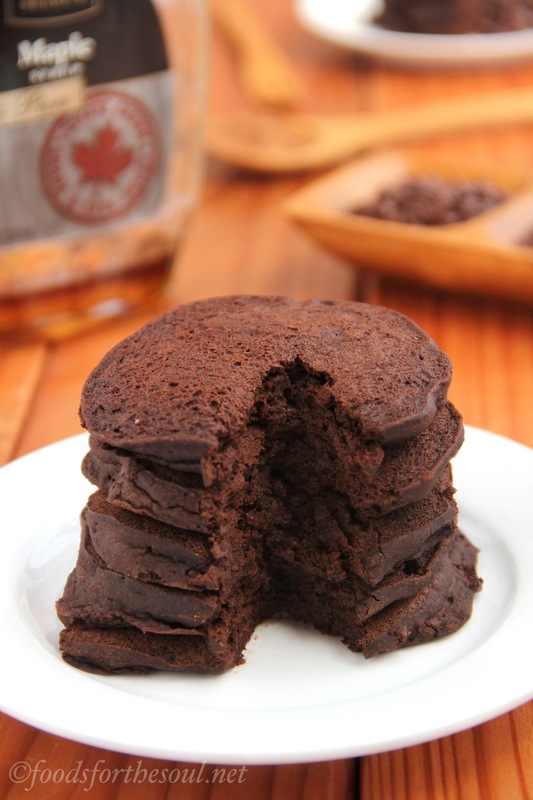 But you can always drizzle maple syrup on top for a little extra kick! Unlike my mom’s traditional recipe, you actually prepare the wet ingredients first. This gives the chia seeds time to soak, soften, and thicken the mixture. They surprisingly provide most of the fiber—there’s a lot packed into those teensy tiny seeds! From what I’ve seen, chia seeds are cheapest at Trader Joe’s, and they’re perfect for sprinkling into oatmeal and muesli too. Like regular pancakes, drop a dollop of batter into a pan coated with cooking spray, and let it sit for 2-3 minutes over medium-low heat. You’re looking for that gorgeous golden color. Slightly impatient, I flipped most of mine too early, but that’s what happens when your stomach rumbles really loudly and demands breakfast! 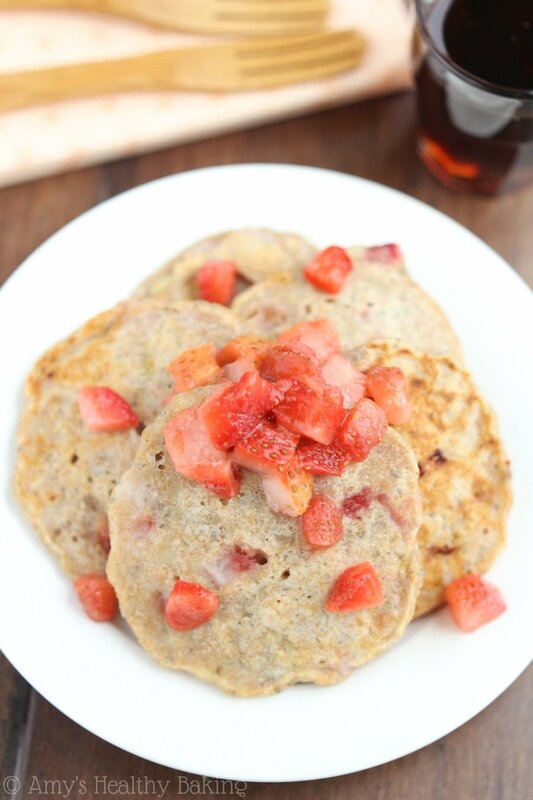 The banana makes these pancakes slightly moister and denser than your typical recipe, but topped with extra strawberries or a splash of maple syrup, most hungry people will gobble them down just as quickly! 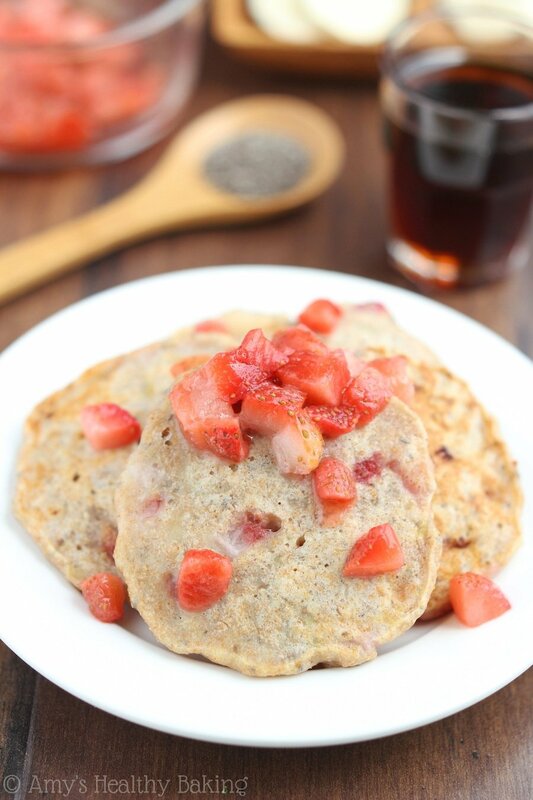 Cozy and comforting, these healthy Strawberry Banana Chia Seed Pancakes bring a taste of summer straight to your plate with their bright fruity flavor. 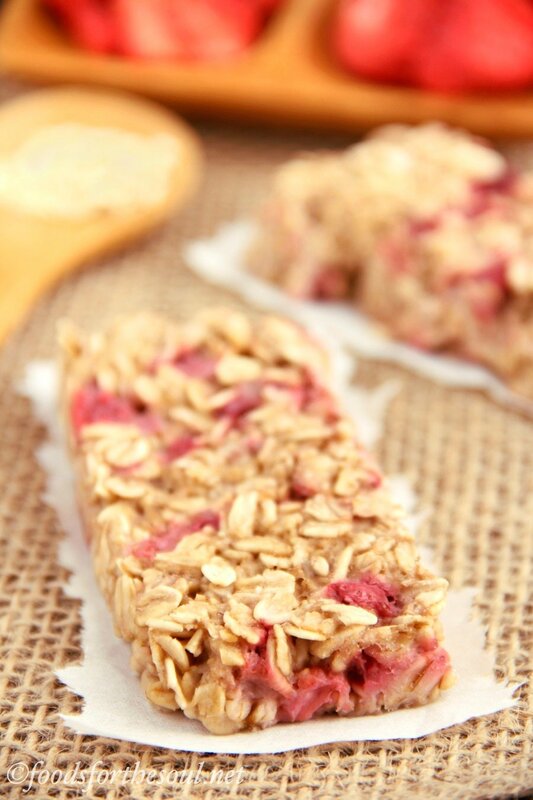 With almost two full servings of fruit in each portion, they’re the perfect way to start your day! 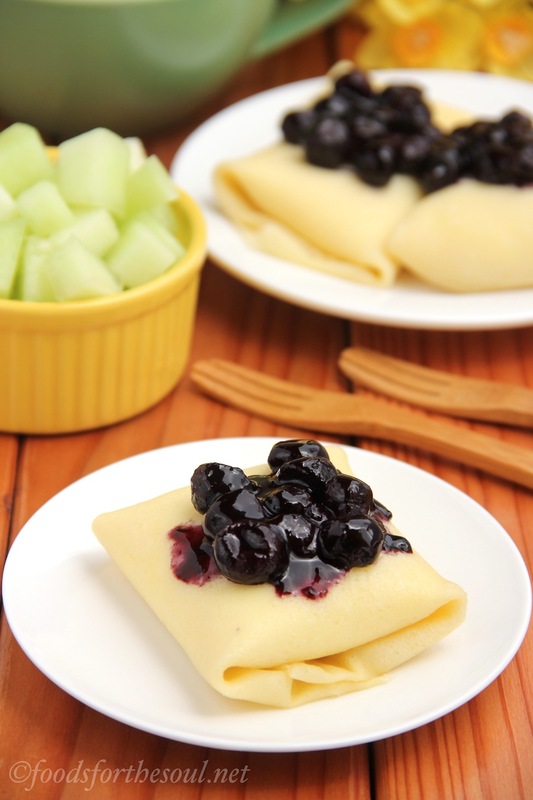 These pancakes taste like summer, and you’ll get almost two servings of fruit! The recipe is easily doubled or tripled to feed a larger crowd, or you can just reheat the leftovers for a quick and easy breakfast. In a medium bowl, stir together the mashed banana, milk, chia seeds, and vanilla. Let the mixture sit for 10 minutes to allow the chia seeds to soften. Whisk together the flour, baking powder, and salt in a separate bowl. Once the chia seeds have softened, stir into the banana mixture. Fold in about 2/3 of the diced strawberries. Coat a large pan with nonstick cooking spray, and briefly preheat over medium-low heat. Drop dollops of batter into the pan, and cook for 2-3 minutes per side, or until golden brown. Recoat the pan with cooking spray before cooking the rest of the batter. 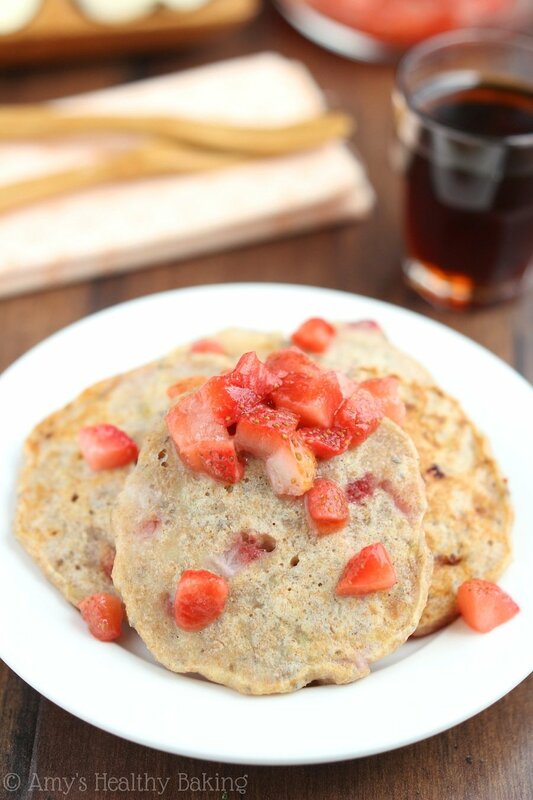 To serve, divide the pancakes between 2 plates and top with the remaining strawberries. 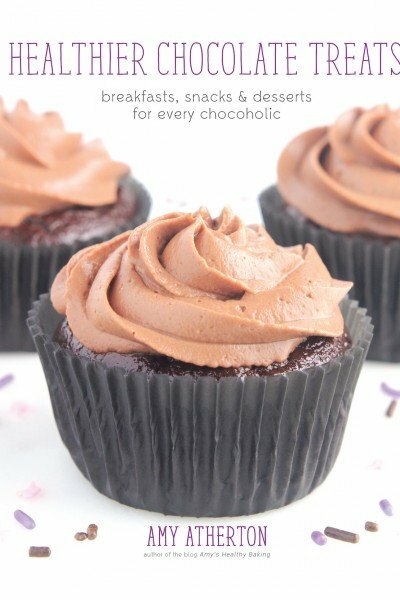 Note: For a vegan version, substitute your favorite non-dairy milk in place of the skim milk. I LOVE going out to places (usually coffee shops for me) and blogging/reading/just sitting by myself and enjoying the hustle and bustle around me. 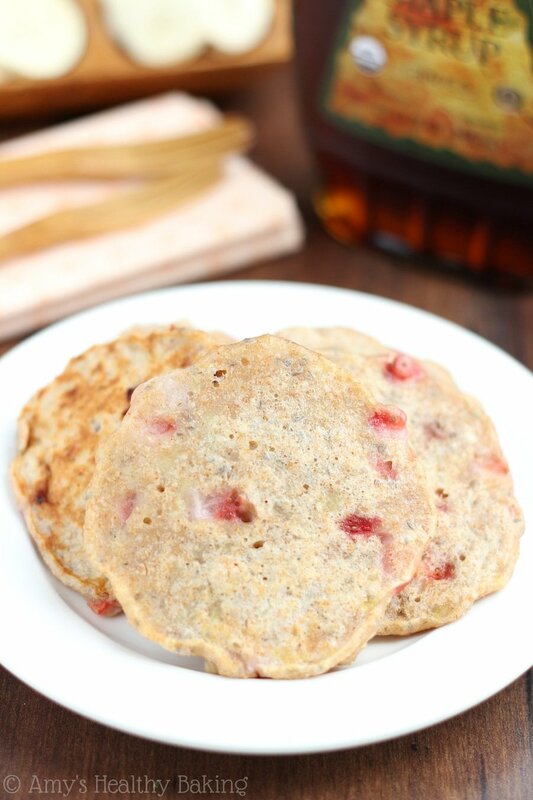 These pancakes look delicious, and I am loving berried right now. Interesting combination.. thanks for the great recipe! I made these yesterday morning (Saturday) for my husband and grown daughter for breakfast. I didn’t double the recipe as I didn’t want leftovers if they didn’t like them. They were ?. It is a smal batch as I only got 5 pancakes but just the right amount. I used a frozen banana from my supply out of the freezer and of course had to have pure maple syrup on top. 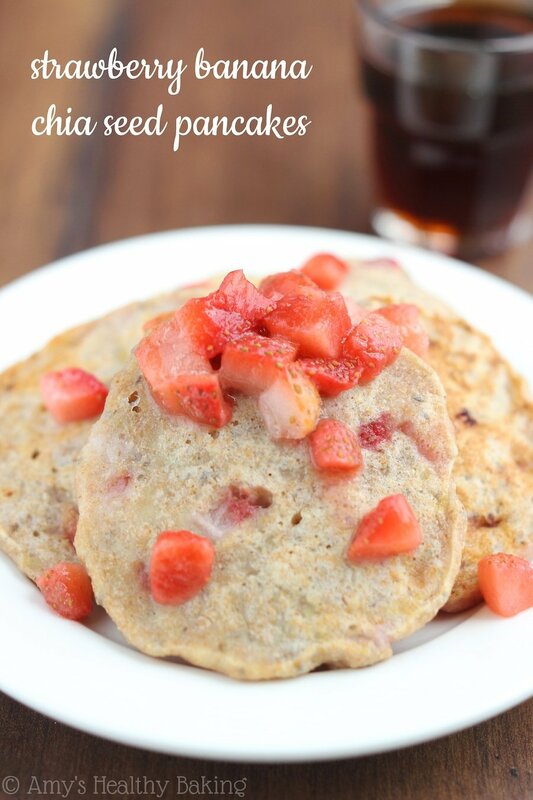 I will be adding this to our rotation of healthy pancake recipes. Going to try the carrot breakfast cookies today. I’m so glad everyone enjoyed these pancakes, Linda! That really means a lot to me that you plan on adding it to your healthy pancake rotation. What a huge compliment — thank you!! 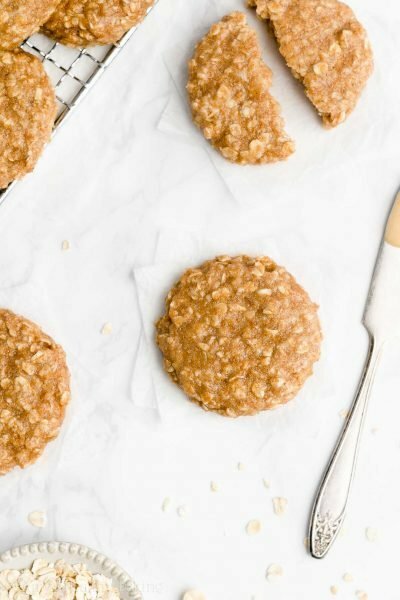 🙂 I can’t wait to hear what you think of the breakfast cookies, too! 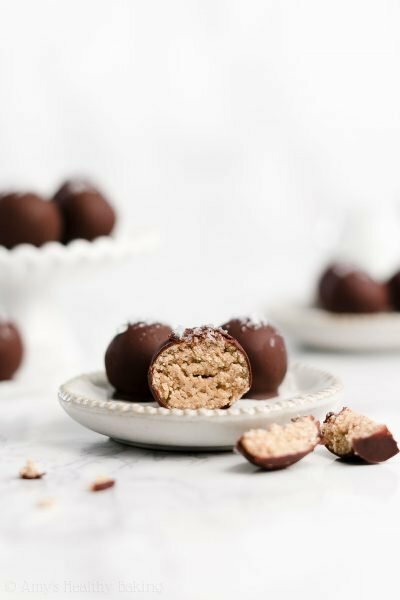 I made these with flax seed instead of chia seed. They came out great!